Zika Likely Was Brought To Brazil By One Person, Lurked For Months Before Cases Reported : Goats and Soda To figure out how the outbreak began, scientists decoded the genomes of Zika viruses in Brazil. The findings suggest Zika could be hiding out in other corners of the world. A molecular model of the Zika virus. The Zika virus was likely spreading in South America — silently — long before health officials detected it, scientists reported Thursday. 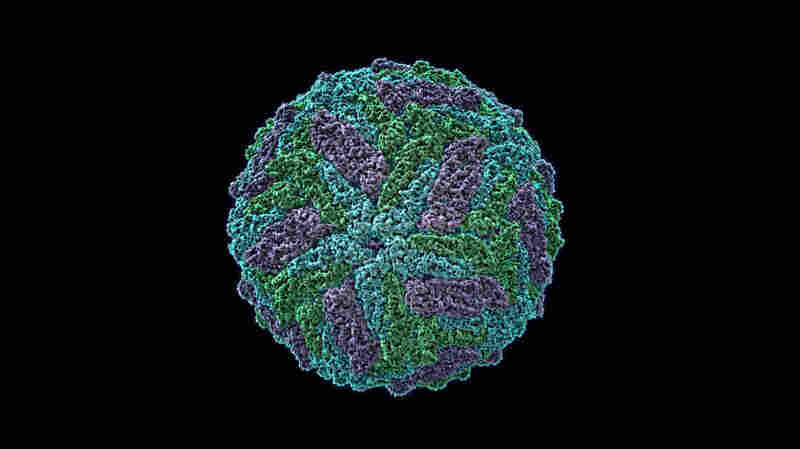 The findings, published in the journal Science, suggest an air traveler brought the virus to the Americas sometime between May and December of 2013, or more than a year before Brazil reported the first cases of Zika in early 2015. Since then, the mosquito-borne disease has spread fast and furiously. It's now circulating in nearly 40 countries and has sickened hundreds of thousands of people. To figure out how the outbreak began, a team of international scientists decoded the genomes of seven Zika viruses found in patients in Brazil. They then compared these sequences with nine other Zika viruses found in Latin America and Asia. "The genome sequences can tell us where the outbreak has come from ... and how it's been spreading," says Oliver Pybus, an evolutionary biologist at the University of Oxford, who led the study. The patterns in the Zika genes suggest the virus entered the Americas only once. And it likely came from French Polynesia, which had a large Zika outbreak in 2013. So it looks as if Zika had months to get a toehold in South America before health officials started fighting it. "This is typical of viruses, like Zika [which cause only mild symptoms]," says Duane Gubler, an emerging disease expert at Duke-NUS Medical School in Singapore. "They're frequently introduced into areas long before the epidemic is recognized." So could Zika be hiding out in other parts of the world without anyone knowing it? "Definitely," Gubler says. He thinks countries in Southeast Asia are particularly at risk. Several countries there have a sprinkling of Zika cases each year. Gubler thinks there's probably a lot more. "We've tried to alert the countries to intensify surveillance for Zika for that very purpose," Gubler says. "This [new] study is really a wake-up call for the region." It's only a matter of time, he says, for an outbreak to erupt there.